Bill sadly passed away on 24th May 2013. He was born in was a scientist, engineer and a polymath. He was passionate about his work and compassionate in his relations with colleagues. He was a humble genius. He was most certainly not a guru – he hates that word! He was not a professor or a PhD, so you never had to call him ‘Doc’ or ‘Prof’! He began his work on the theory in the 1950s and continued to develop, illustrate and apply the theory until his death. His late wife, Mary Powers wrote a personal history for Bill's Festshrift. Bill trained as a physicist and engineer, becoming well versed in the field of control engineering. This field has ancient origins. The first reported control engineered device was built by the Egyptian inventor Ktesibios in 200BC - a float-valve controller for keeping the water in a water-clock's reservoir precisely at a fixed level. 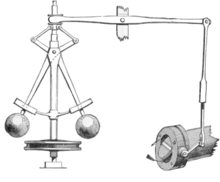 Another control engineering device, the 'centrifugal governor', was developed by James Watt in 1788 to vary, automatically, the rate at which steam entered steam engines so as to keep their speed constant even under unpredictable variations in the loads placed on them. This device was critical to efficient steam power and hence a critical technological development for the Industrial Revolution. Interestingly, in the 19th century, Alfred Wallace already saw the relevance of this machine to feedback in biology. See Cowan et al. 's recent paper. The field of control engineering really took off in the early 20th century, when devices such as aeroplane servimotors, autopilot systems and sound-tracking torpedos were frantically developed for military purposes. As a young boy of seventeen fresh from high-school, Bill joined the Navy to train and serve as an electronics technician, where he learned about control devices. Here is Bill with his family at around that time. He’s the one on the top left. Bill has been responsible for inventing a number of control devices, including a curvetracer for plotting isodose contours in the beam of radiation from a Cobalt-60 therapy machine, the automatic all-sky photometer for use on the moon (for Apollo 18), and he won the Marshall Field Award for his microcomputer system for receiving, formatting, and typesetting satellite-broadcast stock tables in real time. For more details, click here. His sister's publishing company, Benchmark Publications Inc., is publisher of record of a half-dozen of his most recent works, including the second edition, revised and expanded, of the original Behavior: The Control of Perception (2005), and the latest book, Living Control Systems III: the Fact of Control, 2008. The above picture shows Bill with his late wife, Mary. Bill was probably most influenced by the control engineer Harold S. Black. As Powers puts it: 'that morning in August of 1927 when H.S. Black, going on the Lackawanna ferry to work at Bell Labs, suddenly understood how negative feedback works and scribbled the world-altering equations into a blank place in his New York Times, starting several major intellectual, engineering, and scientific revolutions.' See the linked article for more on Black. Bill also became fascinated in the field with Cybernetics in the late 1940s and early 1950s – this was the first major attempt to try to apply control engineering principles to human psychology. See Umplebey & Annapolis (2015) for the history of cybernetics. After seven years of work, Bill published his first paper on what was to become PCT with colleagues Robert Kenley Clark and Robert MacFarland (Powers, Clark, & MacFarland, 1960). His undergraduate mentor Donald T. Campbell paved the way for a degree in psychology, yet ultimately, Bill chose instead to continue his work on designing electronic systems while pursuing PCT ‘on the side’. In 1973, Bill published Behavior: The Control of Perception (B:CP) – a full exposition of PCT that is now the key reference on the theory. On publication, B:CP was showered with positive reviews , for example by such notable figures as Carl Rogers, the creator of person-centred counselling, and Thomas Kuhn the philosopher of science. Since 1985, Bill facilitated the Control Systems Group – an international group of individuals who utilise, study and discuss PCT within a huge range of disciplines. This organisation continues to grow and provide the catalyst for developments in PCT. In 1998, Bill published Making Sense of Behavior: The Meaning of Control – an accessible ‘arm-chair’ introduction to PCT. There are now a wide range of books explaining PCT, including Living Control Systems I and II – edited volumes of Bill’s essays and papers on PCT. Bill’s last book - Living Control Systems III: The Fact of Control – is a tour de force in psychology, philosophy, mathematics and computing. Accompanied by a CD of thirteen sophisticated computer demonstrations of PCT, it provides the best exposition yet of what PCT can offer. But don’t take our word for it… Have a browse of the website to see what PCT can do for you. If you are struggling, one of us can probably help you out… including the many of the archived letters and emails from Bill! To see the papers that cite Bill's key 1973 book, click here.